With barely 20 days to go to South Africa’s General Elections on 8 May, the Democratic Alliance is intensifying its campaign in communities. 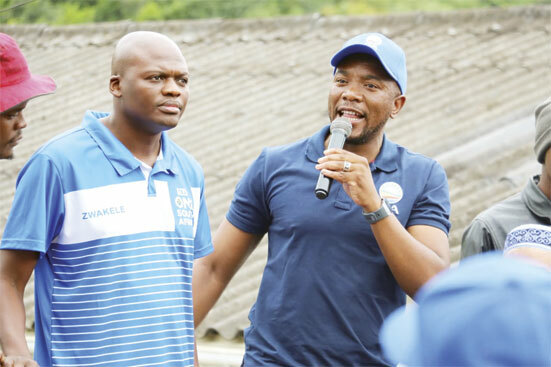 The opposition party’s leader, Mmusi Maimane together with KZN premiere candidate Zwakele Mncwango, and others, visited the Burlington informal settlement on Monday as part of the Kasi-to-Kasi Tour. A voting station in Burlington was the target of protestors who allegedly petrol bombed it earlier this year during the Electoral Commission’s voter registration process. Maimane engaged Burlington residents, a community riddled with poverty, high unemployment and crime, to share the DA’s agenda for change. “The DA today reaffirms the call for a one year internship programme that will allow the youth to get on the job training and experience requisite to contribute to the economy and their communities,” said Maimane. He committed to fixing the windows personally and called on others to do the same in their respective communities. “Our country can only be better if we work together and in unity. Let us build one South Africa for all, today,” said Maimane.